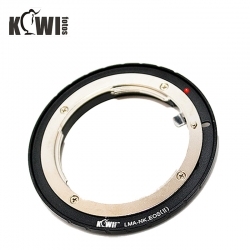 The KIWIFOTOS LMA-NK_EOS(II) ultra thin lens mount adapter is fine finishing, made of black anodized aluminum (camera body mount) and brass silver (lens mount). This adapter allows you to use the majority of Nikon F and AI (auto or manual focus) lenses on your Canon EOS camera, saving you the expense of a costly and irreversible conversion. Since the adapter does not provide electrical contact translation, automatic diaphragm, auto-focusing, or any other functions will not operate correctly. In this case "stop-down mode" will need to be used when metering. The through-the-lens exposure metering function is supported. The Nikon lens has to be set to manual mode or aperture priority. Focusing can be infinity.